Hear the roar of the surf, listen to the monkeys in the mangrove below, or sing along with the birds in the trees... this the best of both worlds. Sitting on the side of a hill gives this well-landscaped, two-acre property magnificent ocean views from every room, while maintaining close proximity to the beach. Whether you choose to take a quick walk to the beach (a few minutes on foot, literally 300 paces from the house!) or drive to one of the many beaches located down the road (a few minutes by car), this property is a perfect retreat. Surrounded by a terrace which offers a lovely place to read, chat, or dine, the house has 3000 square feet of well-appointed living space. Perfect for entertaining the family or for some well-deserved quiet time, this property guarantees a wonderful relaxing vacation. All bedrooms and living room feature banks of floor-to-ceiling windows, furniture, and interior designed for comfort and relaxation. Close to market for those who prefer to cook or close many restaurants if you prefer to dine out. While on our first vacation in Costa Rica in 2003, we came across this incredible house which just spoke to us on some level. The spectacular views, the privacy, the way it made us feel was just magic. To truly understand this, you'd need to know that we definitely are not the most spontaneous people in the world - and we were certainly not in the market for a house. Yet, by the time we returned home four weeks later, we were proud owners of this property. A decision we have never regretted for a minute. This is now our home - and yours when you visit - and by the time we get to the top of the driveway, our whole demeanor has shifted to peacefulness. Many of our guests who return year after year have migrated into wonderful friendships and we've become acquainted with so many lovely families. King bathroom with sink and toilet. toilet, shower, Twin bedroom en suite with sink, toilet and shower. Queen bedroom with ensuite with sink, toilet and shower. Literally 300 paces from our door to Playa Penca or Playa Prieta. Local telephone, also additional US telephone line in the master bedroom with ability to make calls and receive calls at no charge. AC in all three bedrooms. Washer and dryer on lower level, with daily laundry & housekeeping services. Great room with cable, flat screen tv, library of books and games, dvd player and movies. Large refrigerator with freezer space. Coffee maker and coffee filters. Two slice toaster by stove. Dining area for six in the house, also a dining area for six on the terrace. Roku available for those who wish to log into their Netflix accounts. Beautifully kept landscaping and flower gardens, with birds, hummingbirds and butterflies. Terrace wraps around the front of the house with beautiful views of the ocean. A favorite place to hang out with wicker chairs, sofa and outdoor eating space. Kayaks for rent at Playa Danta. Covered terrace surrounding the front of the house, with wicker furniture and dining table. Boogie boards and one surf board in the bodega (garage). Secluded private pool, with breathtaking views. We would stay at this location again. Good location (Potrero is a small village along the beach), private-gated house, great house layout. Needs a few updates - mostly the tile, many places the grout has holes which allow the “Costa Rica Army” to enter. You’ll never keep out all the critters and there are well placed cans of bug spray which we used. It would also give it a better look. Ernesto and the dogs were great to have around. Rusty made his way up every morning for a breakfast of leftovers. Monkeys travel by the house very early, but you can always catch them at the public beach at the end of the road. We felt very safe, left the doors unlocked and keys in the car the entire trip. Like many of the other posts, if you leave clothes out Anna Maria will wash them. You can take two outfits and always have clean clothes. Ernesto and Anna maintain the property (interior & exterior, pool) daily but you never seem notice them. Overall it was a nice stay and if we return would look for this house. This is our second time to the area. Our family of 5 loved this place. 3 bedrooms, great kitchen with dishwasher, new refrigerator, nice stove, and new washer/dryer served us well. The pool was great for a morning swim and play and then we headed a local beach. In our time we went to Prieta, Conchal, Tamarindo, and Penca. We also did a great day sail with Serendipity. This house gave great sunsets. The security was wonderful with an automatic gate and the groundskeepers home on the property with three friendly dogs which meant that a security system was not needed. (The place where we stayed before required an elaborate alarm system where the motion detector created false alarms due to small animals). We felt safe and secure the entire time. I loved the simple feel of the villages of Potrero and Surside to get groceries, fruit, baked goods, and a great dinner. We love the simple atmosphere of Potrero/Surfside and thank Mic for providing a great home for our family to have a great vacation. The house accommodated my family of 6 perfectly. It was convenient that every room has its own bathroom. The views are breathtaking! Ana Maria and Ernesto are such nice people. Ana Maria did an excellent job keeping the home tidy and having our laundry done was a major plus. The pool was great for cooling off. The pups would sometimes go up to say hello but not be bothersome. The beach was quite the treck from the house. Overall yes I recommend the home and wouldn’t hesitate to book again. 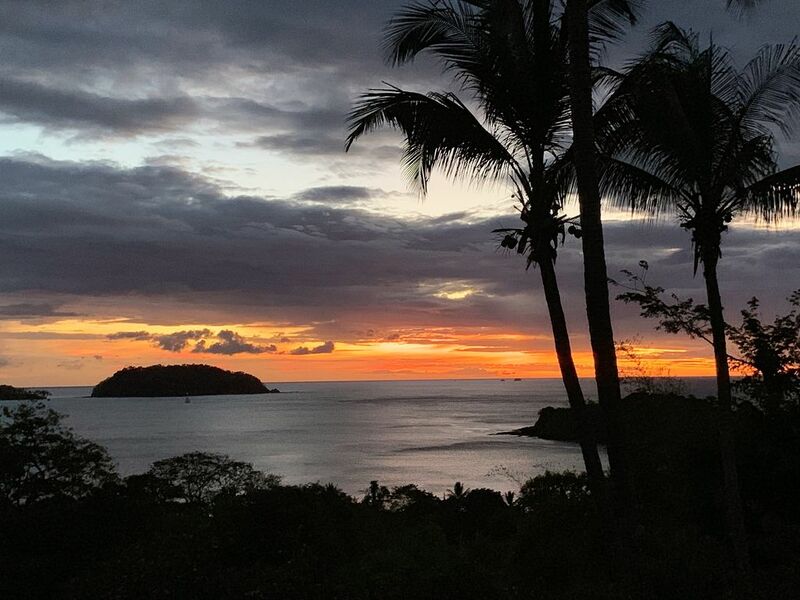 Perfect Vacation Destination In Costa Rica.... Highly Recommended!! This is probably one of the most enjoyable places in Costa Rica. The house is beautiful & the views are second to none in the whole country! We enjoy coming to Mic’s house, it gives us a chance just to sit back & relax in this hustle bustle world. Everything you’ll need is basically supplied. Anna Maria who cleans the house etc is wonderful! She kept our clothes washed & house is kept spotless. Joel keeps the yard perfect & the pool always clean & full. They were excellent as usual! The dogs, Rusty, Javier & Kava were great to have around. They always welcomed us when we returned to the house after days at the beach, Shopping or out golfing. As usual, they’re always nice to have around. There are a couple of nice golf courses close by that can be played. Beaches, shops and restaurants are easily reached by walking. Beach was excellent for ocean swimming & snorkeling. Golfing & Surfing lessons are a short driving distance. A car is highly recommended though for other activities. Thanks again for allowing us to stay at your lovely home in Costa Rica another time, repeat travelers. We highly recommend this house as a destination to stay in Costa Rica!!! You two are out favorite guests ever! Thanks for visiting us again and for taking care of our home as if it were yours. The porch light is always on for you two :-). Hope you had safe travels home - zero degrees in Denver right now so suspect your welcome home was a wee bit chilly. Breathtaking view and amazing location ! Mic’s villa has an amazing view !! Sitting on the patio and looking at the view is stunning, the pictures do not give this justice. The home was clean and had everything you need. The location was perfect for us. You can walk to four restaurants in about 5 minutes. The pizzeria doesn’t have the best view but has the best pizza and bruschetta, we actually ended up there twice. The restaurant across the road is excellent and serves more local dishes and the restaurant on the beach has great pub food, amazing location on the beach and very friendly. Many, many other great restaurants in Potrero which is about a 5 minute car drive away. The villa is in walking distance to two amazing beaches which are empty, we usually had the beach to ourselves. After going to 7 beaches, all in easy driving distance, Playa Penca, a 5-10 minute walk from the villa, was our absolute favourite. Great for swimming and some snorkelling. Our other highlights were surfing with Pablo (Pablo’s surfing school), would highly recommend, he’s amazing. We also went to Cango Canopy for zip lining and the money sanctuary ... amazing day!! I would recommend following Mic’s driving directions to get from the airport to the villa. We used google maps which took us down crazy dirt roads ... if you follow Mic’s directions the drive to the villa is easy and simple to navigate. Anna Maria keeps the villa clean every day, and Joel keeps the grounds immaculate. I would recommend ensuring your clothes are put away if you don’t want them washed - Anna Maria is amazing and has a huge heart and will wash and dry anything in sight. The dogs are the most well behaved dogs I have ever met ... we loved having them around. The wifi was spotty and slow at times but was ok. It is important to note that the other queen bedroom is downstairs accessible via a private entrance, not a problem at all for us but others may want to know this. The wifi does not work at all in the down stairs bedroom. I would also recommend a car rental for sure. The driveway to the villa is very steep so if you are buying groceries or have someone with challenges with hills a car is helpful. Also there is so much to see around this villa a car allows you to explore. We loved it here, thank you for sharing your home.